Since dropping her Color Of You EP back in April, up-and-coming siren Alina Baraz has been making the rounds at our favorite festivals, getting the general public acquainted with the alluring sounds she's been crafting for some time now. 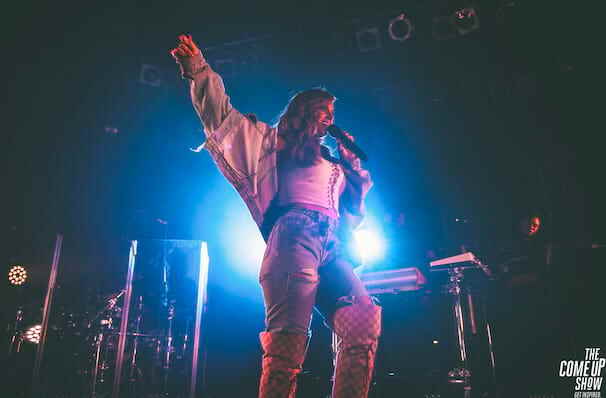 At a mere 24 years old, R&B-diva-to-watch Alina Baraz has ticked off some major milestones early on in her budding career, including supporting Coldplay on tour, collaborating with Khalid and performing at Coachella Festival 2018. Hot off the heels of the release of her latest EP The Color Of You, Baraz brings her signature soul-soaked, smokey R&B to the stage on a national fall tour. Calling to mind her influences Adele, Corinne Bailey Rae and Amy Winehouse, Baraz is likely to embrace the moniker of the next great female vocalist of our time thanks to her velvet, honey-toned vocal style and emotive, poetic lyrics. Her heartfelt and sensual delivery is keenly matched by slick production techniques, sparse beats and subtle melodic hooks, making for an enchanting soundtrack to love, heartbreak and everything in between. Sound good to you? Share this page on social media and let your friends know about Alina Baraz at Emos East. Please note: The term Emos East and/or Alina Baraz as well as all associated graphics, logos, and/or other trademarks, tradenames or copyrights are the property of the Emos East and/or Alina Baraz and are used herein for factual descriptive purposes only. We are in no way associated with or authorized by the Emos East and/or Alina Baraz and neither that entity nor any of its affiliates have licensed or endorsed us to sell tickets, goods and or services in conjunction with their events.